Frying-pan vessels are characteristic finds from Early Cycladic II graves, mainly from Syros, in the flourishing period of the Keros-Syros Culture (2800-2300 BC). They are round and flat with a forked handleand a black or dark brown burnished surface. The decoration, on theouter surface only, is incised and impressed with a white substance in the grooves. The patterns are spirals, concentric circles, triangles and stars. 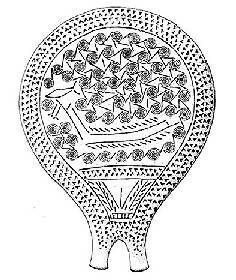 Incised representations of ships are on certain frying-pans. They are very interesting because they show the great development and significance of shipping in the Early Cycladic II period, as well as the type of the early Cycladic ship. It has a prow that rises steeply and oars, but no sails. A fish and a flag are also shown at the top of the prow. A special element of the frying-pans is the pubic triangle which is often incised near the handle. It is similar to that on the Cycladic figurines. It is not known how the frying-pan vessels were used. They have been interpreted as mirrors used with the help of water in the internal surface, as drums in funerary rituals with a piece of skin stretched over the mouth, as idols and as vessels for libation or for offerings to the dead.